Known as the Strawberry foxglove, due to its delightfully coloured blooms – a cross between D.purpurea and the yellow flowered D.grandiflora – quite delightful. 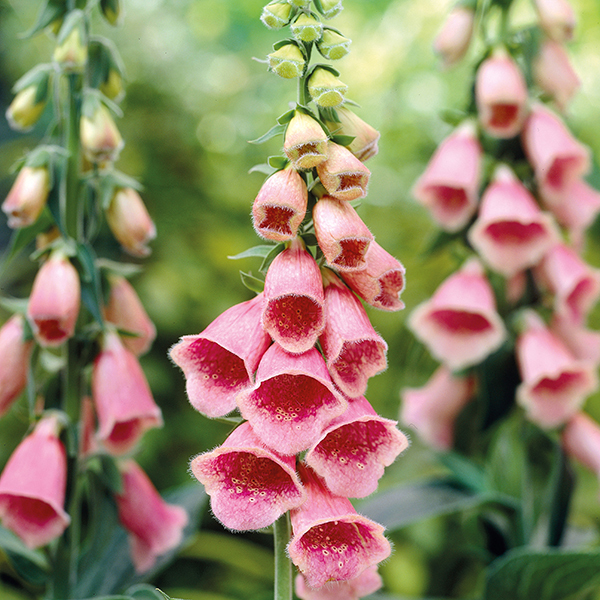 Known as foxgloves, these delightful plants make for some of the best and early to flower cottage garden plants – planting in the autumn will guarantee flowers the following year. Loved by bees and butterflies, they are also wonderful for cutting and enjoying indoors too. Plant in full sun or part shade in well-drained but moist soil. Our potted 9cm perennial plants have been selected for their strong garden performance providing colour and interest to the garden from early to late summer. The range includes a wide and varied selection and represents many of our favourites, as well as some up and coming new stars. Autumn is the perfect time to be planting herbaceous perennials – the soil is still warm from the summer months, which helps the plants to establish before the worst of the winter sets in. Our plants are grown and potted to order and delivered to our nursery, around the middle of September, where they will be packed and despatched to you and will arrive ready for immediate planting into the garden – a complete growing guide will be included with your plants, helping you to get the best results. We hope you have as much fun choosing your plants as we’ve had selecting them for you!